Theresa May delivered a flash statement in Downing Street following the Salzburg Summit, saying that an impasse had arrived in negotiations. On the Salzburg Summit, May said the EU were ‘still only offering two options’ for the future relationship which would either make a ‘mockery of the referendum’ or ‘division in the United Kingdom’. The proposals are an EEA + Customs Union option or a Free Trade Agreement with the first limiting the UK’s ability to control border and its trade policy and the second not offering a solution for the Northern Ireland border. She stated that the EU had rejected her Chequers proposals as they would impact the Single Market ‘without offering any real explanation’ or supplying counter-proposal that respected the UK’s position. She also appeared to make an assurance to the three million EU citizens living in the UK, appearing to indicate that they would retain their status in the UK in the event of a no-deal scenario. On the Northern Irish backstop issue it can inferred from the speech that the UK could be close to offering a regulatory solution to the border issue, as opposed to introducing an internal customs border that had previously been advocated by the EU. This would be on the basis that the Northern Ireland Assembly, once reassembled, accepting such a proposal to align with the rest of the island of Ireland. The speech sought to further entrench that the Government will continue to base its position on Chequers, whilst May asked the EU to offer solutions that respected the UK’s position to break the impasse. She further ruled out ‘overturning the result of the first referendum’ and said the two main areas of disagreement on the Northern Irish border and future relationship needed resolving by both sides. The proposals put forward in the coming weeks on the Northern Irish backstop are likely to determine whether progress is made in that area, whilst there appears to be continued disagreement on what the future relationship should look like. The pound dropped following the speech. Labour Leader Jeremy Corbyn said that the political games being played out between the UK and EU need to end, with no-deal not being an option. In a scene reminiscent of the most recent Bond film, Spectre, EU leaders met to hear Theresa May deliver a last-ditch 10-minute speech aimed at gaining their support on her Chequers proposals. However, the EU27 remained resolute and square behind the Commission, saying that the proposals for economic cooperation set out in the white paper (read: common [EU] rulebook and dual-tariff regime) were not acceptable given the need to maintain the ‘integrity of the Single Market’. There were some positive soundings in the ensuing press conferences however, with Council President Donald Tusk saying he was a little more positive that a deal would be reached than he has previously thought. The summit in which case should probably not be looked at as an abject failure, with May pointing out that refusals to engage with certain elements of her Chequers proposals were merely a negotiating tactic. Brinkmanship was in full flow too, with the EU seeking to give a united front despite individual statements in the lead up to the summit for the EU to give more ground to make progress. Netherlands Prime Minister Mark Rutte even went as far to say in a press conference that the Netherlands was more prepared for a No Deal scenario than the UK – perhaps said defensively, but more likely said in knowledge of the tactics the EU would use to put the pressure on in the final weeks – namely that the EU thinks the UK is unprepared and unwilling to go to the cliff edge, and if it does so, some, such as Joseph Muscat of Malta, want ‘the impossible’, a second referendum. Finally, Donald Tusk has said October must be the month where it all comes together, and big decisions are made, with an ‘extraordinary summit’ to be called in mid-November to sign off any final agreement. This however leaves negotiators unclear of the point of maximum leverage or concession – do they push it in October, to the summit or beyond? When and would the UK walk away at this point? Would it negotiate to the bitter end? Would it drop Chequers and propose an enhanced FTA? At this point it is very hard to say. Pressure on May, whilst mounting, is not critical – allowing her to continue along her current path. Equally domestic pressure on EU leaders in their respective countries has not reached breaking point and is unlikely to do so unless no deal becomes a reality and thick-and-fast disruption to supply chains and markets ensues. So, with 6 months to go, who will blink first? 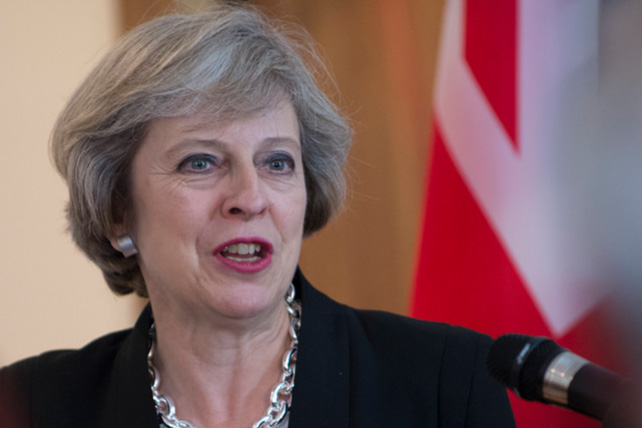 Theresa May has questioned the EU Council’s rejection of her proposals for economic partnership set out in the Chequers White Paper. EU Council President, Donald Tusk, said that the proposals “will not work”, given the impact they will have on the integrity of the Single Market. May has said her proposals are the only plan on the table that maintain a frictionless border between Northern Ireland and the Republic of Ireland (ROI) whilst respecting the UK’s red line on not imposing a customs border ‘down the Irish Sea’. The border issue remains one of the key sticking points that risks scuppering the Withdrawal Agreement with the EU saying, “there will be no withdrawal agreement without the backstop”. The European Commission and UK are both set to release new proposals for the backstop, which will need to be made operational in the event of a no-deal scenario beyond the implementation period. Whilst the UK’s proposals are less clear, with current plans focused on how the border would operate in conjunction with the future relationship, the EU’s backstop plans focus on additional regulatory checks in the UK. The Commission is expected to ask for agriculture and phytosanitary checks to be carried out between Great Britain and Northern Ireland to maintain a frictionless border with the ROI. Prime Minister May has said such a proposal is “unacceptable” given the “constitutional and economic integrity” of the UK’s own internal market which allows the free flow of goods across the territories. The Commission has sought to ‘de-dramatise’ the issue, however, the UK is seeking to stand firm on their position, further entrenching the positions of both sides as they call each-others plans unworkable. The issue continues to be a big issue as both sides consider what each other’s proposals mean for the Single Market, the Good Friday Agreement and the internal market of the United Kingdom. The Migration Advisory Committee has released its report, commissioned by the Government, looking at the UK’s current immigration system. Key recommendations within the report included suggesting that the cap on high skilled migrants coming into the UK should be scrapped. It also calls for EU workers to be subject to the same visa rules as migrants from third states after Brexit, although it recognises that EU/EEA area citizens may be offered special status under a Brexit deal. It further recommended limits on the number of lower-skilled workers – something the Road Haulage Association’s CEO, Richard Burnett, called ‘ignorant and elitist’ given the need for lower skilled workers by many companies. It’s biggest statement on migration from the EU however says that it sees “no compelling reasons to offer a different set of rules” for workers from the EEA compared to other countries… given their impact is dependent on skills, employment, and use of public services, and not fundamentally on their nationality”. Home Secretary Sajid Javid has suggested that he wants to see limits on visas offered to EU citizens after Brexit as part of a ‘global migration system’ that acts more fairly, with freedom of movement restricted. The Immigration Bill, which is set to be announced this year, will consider the Migration Advisory Committees recommendations before bringing the bill before parliament. The final content of the bill is likely to determine how the EU will respond, with equal measures and status placed on UK citizens as a result – potentially limiting how easy it will be to move or work in an EU state – dependent on national immigration policies of EU states also. Building on comments by European Research Group Chairman Jacob Rees-Mogg that the Prime Minister’s Chequers proposals were like a dying duck in a storm, former Home Office Minister Sir Mike Penning went one further referring to them as ‘dead as a Dodo’ after raising to May’s chances of success in passing them through Parliament. Penning, a Eurosceptic and former Maastricht rebel, said that unlike John Major’s feat of wearing down rebels on the Maastricht Treaty that consolidated organisations into the modern-day EU and introduced the euro, May would not be able to ‘peel off the numbers’ to pass her deal. A case looking at whether the UK can unilaterally revoke Article 50 has been referred to the European Court of Justice after the Court of Session in Edinburgh overturned its previous decision not to allow the case to be heard. The Government said it was disappointed by the decision but remains committed to delivering on the result and ‘will not be revoking Article 50’. Scottish Green MSP Ross Greer welcomed the ruling, saying that it would be good to know that a no deal scenario was not the only option if negotiations break down. The ECJ will not however advise the UK Parliament on what actions to take dependent on its ruling but would only be ‘declaring the law as part of its central function’. German industries are preparing for the impact of a no-deal Brexit, after facing similar challenges brought on by the trade war currently being played out between the US and China. Eric Schweitzer, President of German export lobby DIHK, commented that “the world trade system is ever more out of joint” with “Brexit bringing immense challenges… and profound consequences across many fronts”. The Telegraph has reported that media channels across most of the 27 other member states have focused on the economic impact on the UK due to leaving the bloc, with little said on the knock-on effect in member states from the UK leaving without a deal. Germany, for example, holds a €47 billion trade surplus with the UK, the largest of all its EU export markets. This has led to the DIHK establishing Brexit awareness events across Germany in September and October alongside the German finance ministry and customs directorate to help business prepare for any fallout from negotiations collapsing. The government of Victor Orban, the Hungarian Prime Minister has launched a media campaign against a European Parliament resolution following disagreements. The resolution called for the European Council to pursue sanctions against Hungary after systemic problems with judicial independence, media freedom and the rights of refugees and minorities were found. The first media posting on Facebook claimed that the European Parliament’s ‘pro migration majority’ wants to silence them because they ‘defend their homeland and Europe with a fence’. The government is further challenging the decision within Europe’s highest court after announcing that it should be invalidated on the grounds it did not consider abstentions. Article 7 of the Treaty of the European Union was triggered in December 2017, meaning the EU Council is considering sanctions and the withdrawal of voting rights for Hungary. Bulgaria has voiced its opposition to such a move, with Deputy Prime Minister Krassimir Karakachanov saying such action ‘infringes on Hungary’s sovereignty’, and that “One day it’s Hungary, tomorrow they prepare it for Poland, and one day this can hit Bulgaria’. Speaking on the day before the Salzburg summit where migration was discussed, alongside Brexit, Orban vowed to retain control of its border policy saying they would not let anyone ‘take one iota of our border control rights’. Watchdog group Transparency International has lodged a formal complaint with the European Commission over concerns that Czech Prime Minister Andrej Babis may be violating EU budget conflict-of-interest rules due to his links with Agrofert. Agrofert, of which Transparency International argues Babis is still ‘the founder and 100% end-user of benefits’ that the two trusts that the manage the firm receive. The firm control some of the largest areas of agricultural land in the Czech Republic and has deep interests in Common Agricultural Policy reform, leading the firm to the conclusion there exists a conflict of interest in the way Babis fulfils his political role. Babis rejects the statement, saying that Transparency International lacks independence. The EU’s budget for the 2021-2027 period, called the Multiannual Financial Framework (MFF), is currently under discussion between the EU Commission and EU Council and will decide budget allocations for policy areas including the Common Agricultural Policy (CAP).